A little wild salmon for post Valentine’s Day brunch. The lightest and, perhaps healthiest, way to gently coax the flavor from the fish. So, here is Abigail Adam’s original recipe, with a boost of flavor in italics. Make sauce: Scald milk (or white wine) with cream, sliced onion, minced garlic. ½ bay leaf, 1 whole clove. Remove film from surface, if it forms. Melt butter in a saucepan and whisk in flour over low heat until smooth. Slowly pour in scalded milk mixture until it bubbles. Poach salmon: Wrap the washed, cleaned piece of salmon in cheesecloth, so it can be removed from broth after cooking. Bring 2-3 ads of salted water to a boil, add peppercorns, bay leaf and lemon slices. Boil 15 min., then reduce to a simmer and add salmon. Turn up heat until broth is just about to boil and simmer slowly until salmon is cooked, about 6-8 min. per pound. Do not over cook, the salmon will flake easily when done. Lift salmon from stock, remove cloth, skin carefully and place on a warmed serving platter. 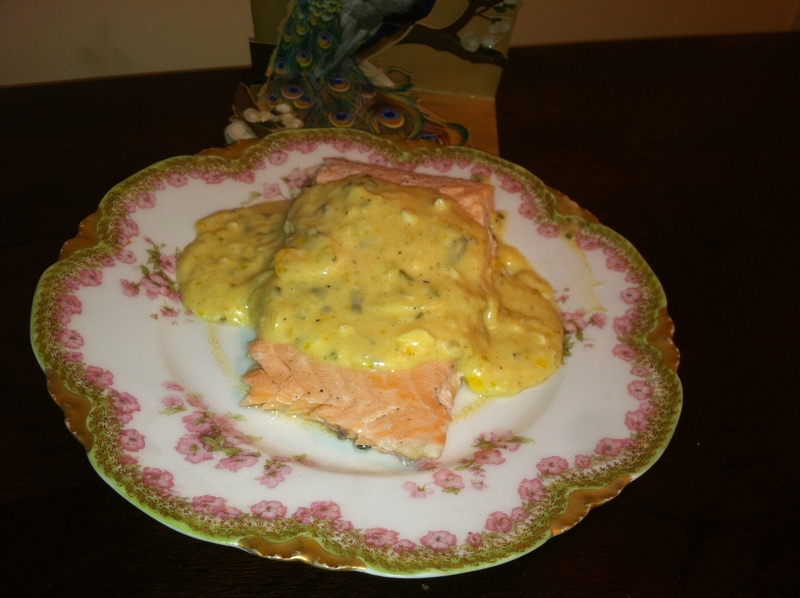 Finish sauce: Reserve about a cup of the salmon stock to use to thin and flavor sauce as needed. Strain sauce into a saucepan, season with pepper, salt, stock, dill weed, lemon and 2 chopped hard-boiled eggs. Taste as you add lemon squeeze and adjust seasonings. Garnish salmon by topping it with Sauce, capers and more chopped (almost soft, hard-boiled) eggs, parsley, lemon slices and serve.